‘I know I love and understand you more now because I love myself and understand myself more deeply than I did when we met.’ The beauty and the grace of relationships, how much we grow and learn about ourselves. Andrew, thank you for sharing this deeply touching and beautiful love letter to your wife Samantha. A powerful reflection for the evolution that is offered within relationships that is tangible and felt by all. As I have observed and learnt over the past year or so, when love is expressed with another, it is a blessing for all to connect with and evolve. It can never remain just with a select few, it is actually impossible, because, when connected to love is in fact everywhere. Great observation. When love is truly expressed and appreciated, it is a Universal expression. It touches and includes absolutely everyone. Thank you Andrew, a powerful way showing us that we must commit to what we truly love. Personification of love and appreciation. The deep appreciation felt in this letter supports your relationship to develop and grow deeper every day Andrew. It is a great example to show how all relationships can be for everyone. A deeply touching sharing of your relationship and commitment to it and expanding love for yourself and each other and all relationships in your daily life with the joy and appreciation this brings. Very inspiring and tangible to feel . As I read this deeply touching love letter I could feel the glorious ripples flowing from it out into the world. A world that is in desperate need of knowing what a true relationship is, one that is forever evolving and one which has the power to unite us all in one huge relationship – a true relationship with humanity. It is so glorious that you have shared this and not kept it to yourselves. Expressions of love such as this need to be the norm, and sharing it brings it out into the open as an example and inspiration for others. Thank you. What is equally beautiful about this beautiful love letter, is your willingness to share it with everyone Andrew and Samantha. So often, a love letter is kept for ‘your eyes only’ and no one then gets to feel the depth of love that is there to be shared. 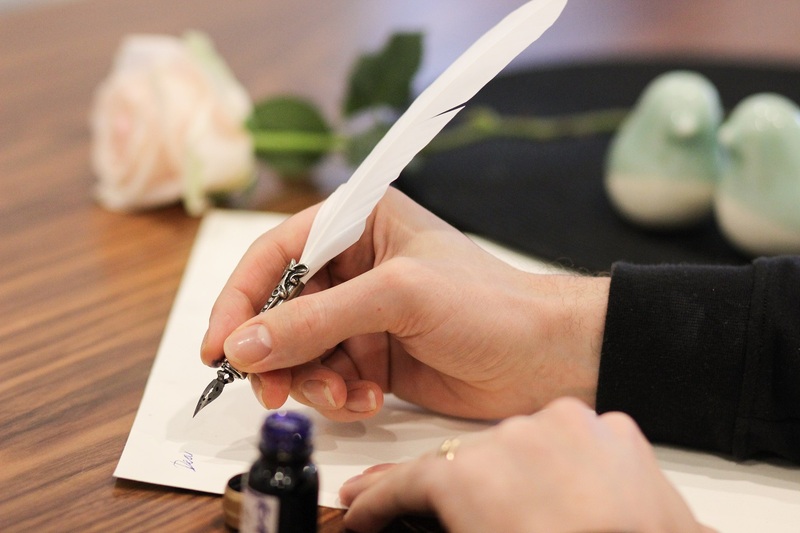 I love the idea of love letters, writing to everyone in my life, from the depth of my heart, in pure appreciation for our relationship – from my lover, my friends, my cleaner, DIY man, my practitioners and to myself. I know exactly what you mean, I had the washing machine engineer with us yesterday and I unequivicably felt love for him, who he was, he was sweet, caring, gentle, committed, open, we talked about puppy training, children and the washing machine and we really enjoyed meeting one another, and we both said it, and then on our dog walk it happened again a lady sat with a 6 week baby, we talked about life, children, relationships and I again felt love for her, who she is in essence, and the baby and she said ‘I feel more like myself meeting you, thank you’. When we see and appreciate someone for who they are in essence, this is an energetic love letter, we can write it and we can sing it, we can feel it, express it and it confirms what is love and truth in life. Every relationship / encounter can have this quality, even when it is not reciprocated it can still be felt by both. Love letters being shared all over the place what a shift in the quality of life we live….love this suggestion and observation. It is beautiful to feel the depth of love between you and gorgeous to feel how willingly you both share it with everyone. This is truly the way forward for humanity. Reading this today I can feel the space that is in the relationship through the way you describe the ‘out-of-this-worldness’ of the connection. It is far deeper that we can often express. You have found the words to offer us all an opportunity to investigate it further. Thanks you. A beautiful inspiration to go deeper with loving ourselves – for the quality of tenderness you share here Andrew is so palpable. A great reminder that the way we express – everyone can feel. The depth of love and appreciation here is so touching. And this is possible because of your love and appreciation of yourself. So very beautiful. “Sometimes the way we live together seems so normal and natural that I don’t fully appreciate what we have already.” So often love is written about through passion and emotion – what makes this beautiful is the acknowledgement and celebration of the everyday moment to moment steadiness, a foundation from which to explore and deepen. Absolutely the true foundation that is to be celebrated and appreciated. I agree and then the passion and attraction seem so shallow!! It is certainly not that the attraction isn’t there and the relationships stop being passionate but there is no sense of need or urgency. It is a sinking back rather than a reaching out perhaps. The heartfelt appreciation is humbling and super inspiring. There is such a huge difference between emotional romantic love which sets us up to look for love in the other to fulfil us, instead of being that love with ourselves first. When we bring that solid foundation to relationships where we can meet our own needs, both parties can grow and deepen in expressing and sharing more love. How important it is to appreciate love in our lives. If we do not do so, it could very well be there in full, but lay obliterated by other life events, problems, issues, challenges etc. An important reflection for us all Andrew. Simply wow… heartfelt or what! This is beautiful Andrew, truly beautiful to read. And the bit I love the best, is not just the honouring of another, but the recognition that the more you have developed a love for yourself, the more love is available in and for the relationship. Yes, it is a great feeling when you have been together for years or decades and it feels as if you are only just getting started. Most relationships after 15 years are at best stagnant, but often also abusive, abandoned and completely under-appreciated – it’s heart-warming to read that if approached correctly and if truly cherished this doesn’t need to be the case. How you express how you are aware of the divine essence inside Samantha brings a knowing that there is more to life than the human aspect. This essence is within us all, but it is gorgeous for you both to be in a relationship where this is felt so deeply. What is beautiful about this letter is it doesn’t make the other person better or greater, nor does it shut the world out, it is an expression of love that holds the person expressing it equally. Sometimes love can be inspired the other way around, that is with a so called “stranger” first, for instance deeply letting in a new client with a deeply profession yet human openness and sharing that can be just as intimate, and can be an inspiration to take home to our families and share with those we may feel more vulnerable with, due to our past hurts and experiences. We can raise the bar on love with anyone, and share it with everyone. How we feel about our partner is really the initial inspiration to feel that way about everyone, to make a loving expression our natural way whoever we are with, it just takes a different form of expression, naturally, with others – but the truth is our love is a state of being and living that cannot pick and choose who to love and who not to – you either are love, or you are not. The more we love ourselves the more we are able to love another. Or it could be expressed this way . . . the deeper we know and love ourselves the deeper we can know and love another. ‘I know I love and understand you more now because I love myself and understand myself more deeply than I did when we met.’ what a beautiful foundation for deepening your love in your relationship, coming from the understanding and love for your self, and so expressed in your love letter. With love and appreciation such as this relationships become an expression of the love that we are from deep within. This is such a gorgeous article to read. We should have far more literature like this around which reflects the true glory that we could all be living and inspires us to be the most divine expression of ourselves that we can in any moment be. I agree Golnaz, it would be amazing if more magic was put into words – like this – rather than aimless gossip or words only for dramatic effect. Here here – I agree – there is so much left unsaid – not just in speaking up or expressing truth where needed, but also in expressing appreciation and love (also in truth). Yes, expressing love and truth – the more we do it the more it can come from our livingness and be transformative for everybody. Your relationship is a great example of what is possible when 2 people say yes to deepening their own love and the love for each other….very, very beautiful and inspirational. We could all do with writing love letters to those around us, in appreciation of who they are and what they bring to the world. Each loving relationship we have has the opportunity to grow the whole of humanity, for us all to grow. It is beautiful to read when someone digs deep and appreciates their every day and the people around them.. inspiring stuff. It’s so rare to read something like this, open, heart felt and full of true Love. It’s something crazy about our society that we have made internet rants normal but this natural expression rare as hens teath. Maybe if we stopped ranting we would find this preciousness is there deep underneath. Oh yes please. It is time to stop the ranting and unloving games. I would love to have an internet full of expressions such as this blog – “open, heart felt and full of true Love” expressions rejoicing the exquisite preciousness that every one of us have deep within. I agree Joseph there could be a lot more appreciation, truth and love shared on the internet rather than the usual serving of lies, criticisms and judgements. Andrew, reading this love letter makes me realise how much appreciation we can have for each other. It is very beautiful to express this and not hold back how you feel. I love that you have shared your love and appreciation for Samantha for all to share and be inspired by. A true confirmation that we are in relationship with another being of light not just another human person and that being in a truly loving relationship is always about the commitment to the quality of light you bring to each other, not just what you say or do. Andrew your expression is in itself expansion and so when applied to the all, which all expression can’t help but be, it supports the all to expand. And so the question for all of us is ‘is what we are expressing a form of contraction or expansion?’. This love letter for your wife is for us all, thank you. Yes Fiona this is what I felt too as I sat down to write this letter for my wife. By the end I realised it was a love letter for everyone. I feel expressing our love for someone has become very rare, it is not what we are surrounded by. So thank you for doing so and thus setting a standard how natural this can be. I agree Esther – we don’t naturally often express how we feel, how much we appreciate others – and a lot of this is left unsaid in daily life. Instead of the usual complaining and moaning, imagine if we expressed like this to each other more how confirming and uplifting this would be. I agree Rachel, and it would start with us – not self bashing, not moaning about ourselves, and being more appreciative of ourselves. ‘I deeply appreciate the blessing of having you in my life, and having this golden opportunity to walk beside you in this life hand in hand.’ Thank you Andrew for so openly expressing the love and inspiration that is reflected in your life together where you have both been so open to the expansion that is available to you and to all through you. This is truly inspiring Andrew … to feel the depth of your love, tenderness and sensitivity that is in fact innate within us all – men and women equally so. In relationships, we can often take each other for granted. I love how much you appreciate your wife Andrew and how everything your relationship is reflects to others around you. It is horrible to hear couples making derogatory comments to each other, often in public, but you show it is possible to hold each other in great respect and honour. I agree Gill and it is not only that Samantha is appreciated which I feel as humanity we are not so hot on this (truly appreciating another/others) but the fact that their love is continually deepening and expanding which is so gorgeous to feel. Very inspiring.